Five hundred and sixty-two (562) chromolithographic Allen and Ginter, Richmond, Virginia, trade cards. 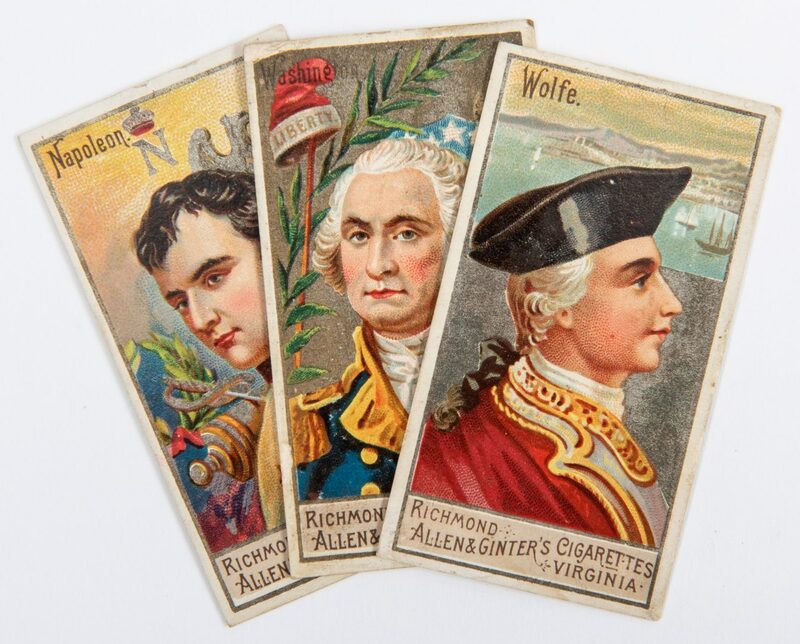 1st-50th item: Fifty (50) "Great Generals" trade cards. Lithographed by George Harris and Sons, Philadelphia, 1888. The front of each card is titled with portraits of the generals before scenic vignettes. The back of each card provides a list of the generals included in the series with manufacturer's marks, below. 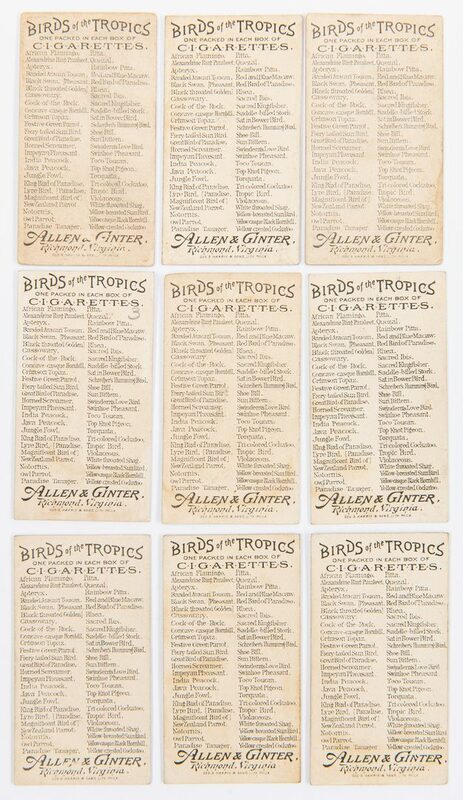 Trade cards approximately 2 7/8" H x 1 5/8" W. 51st-99th items: Forty-eight (48) "Birds of the Tropics" trade cards and book, 49 items total. Lithographed by George Harris and Sons, Philadelphia, 1889. The front of each card is titled with scenic images of the birds in their natural habitats. The back of each card provides a list of the birds included in the series with manufacturer's marks, below. 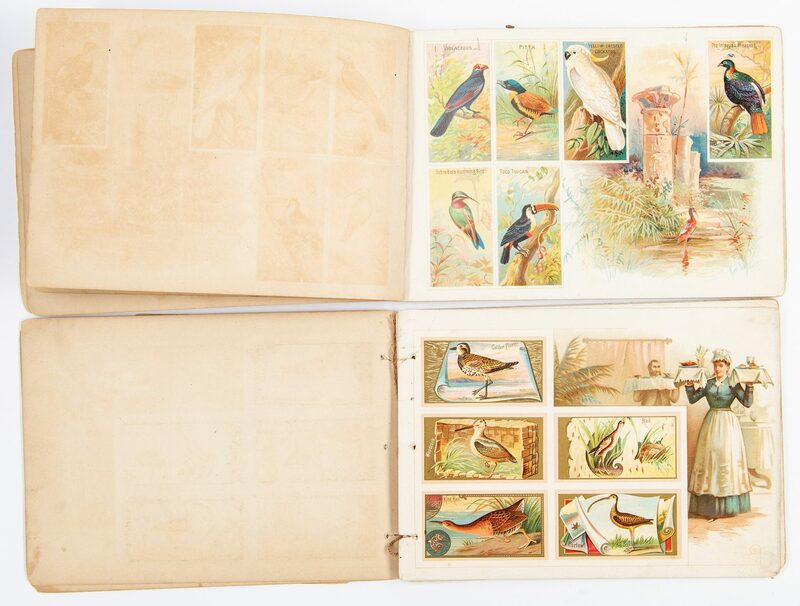 Includes "Birds of the Tropics" book, published by Allen and Ginter, Richmond, VA. Softcover with yellow cord stitching, contains reproductions of each trade card with decorative vignettes and advertisements, inside of front and back cover. Trade cards approximately 2 7/8" H x 1 5/8" W. Book – 6 1/8" H x 9 1/8" W x 1/8" D. 100th-148th items: Forty-nine (49) "World's Smokers" trade cards. The front of each card is titled with a portrait of the identified smoker. 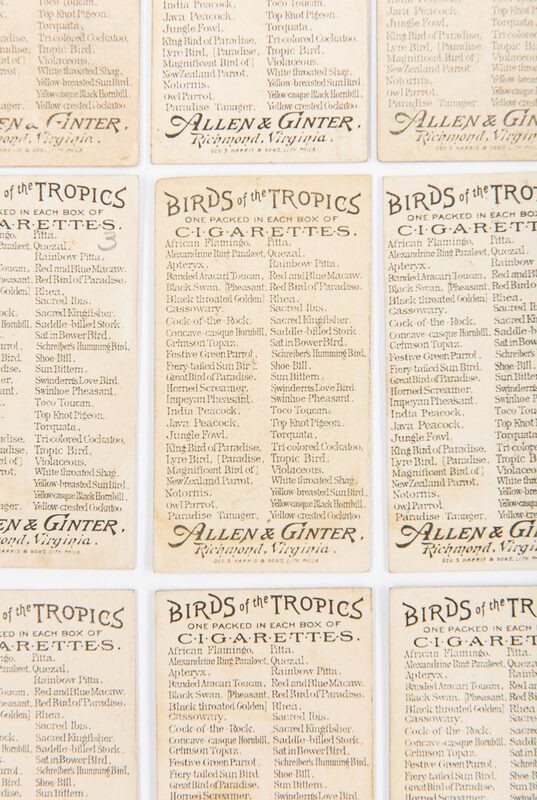 The back of each card provides a list of the smokers included in the series with manufacturer's marks, below. 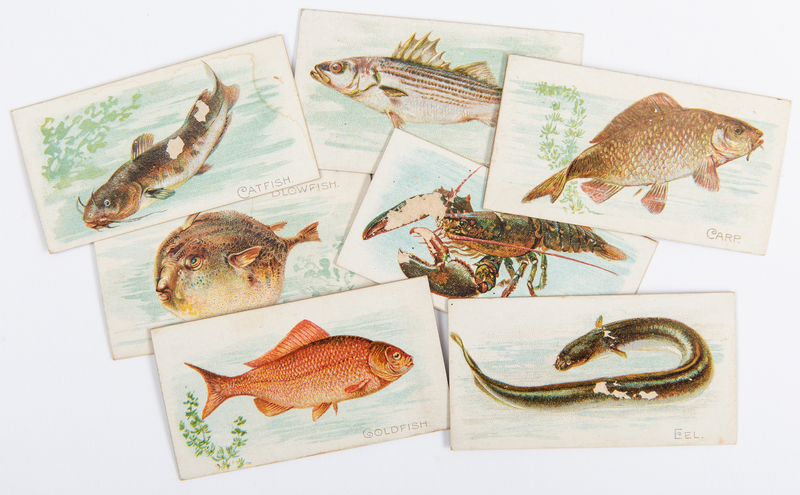 Trade cards approximately 2 7/8" H x 1 5/8" W. 149th-196th items: Forty-eight (48) "50 Fish from American Waters" trade cards. Lithographed by Lindner, Eddy, and Clauss, New York, 1889. The front of each card is titled with scenic images of the fish in their natural habitats. The back of each card provides a list of the fish included in the series with manufacturer's marks, below. Trade cards approximately 1 5/8" H x 2 7/8" W. 197th-241st items: Forty-four (44) "Game Birds" trade cards, plus book, 45 items total. Lithographed by George Harris and Sons, Philadelphia, 1889. 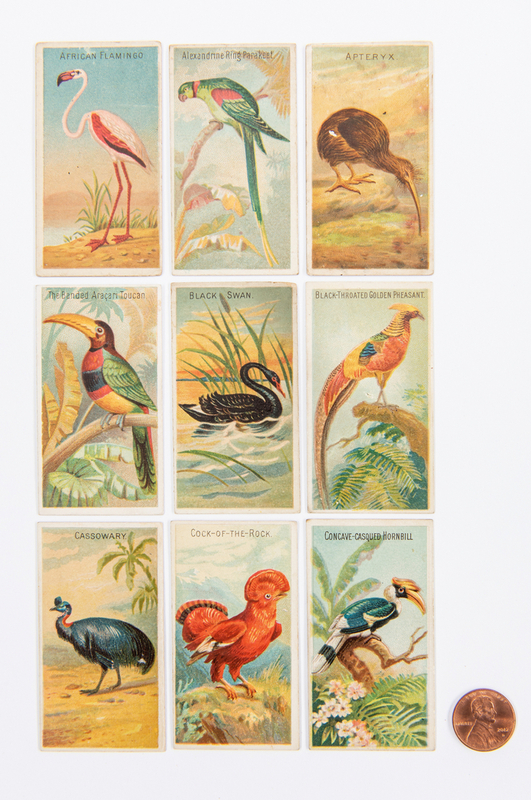 The front of each card is titled with scenic images of the bird in their natural habitats. The back of each card provides a list of the fish included in the series with manufacturer's marks, below. 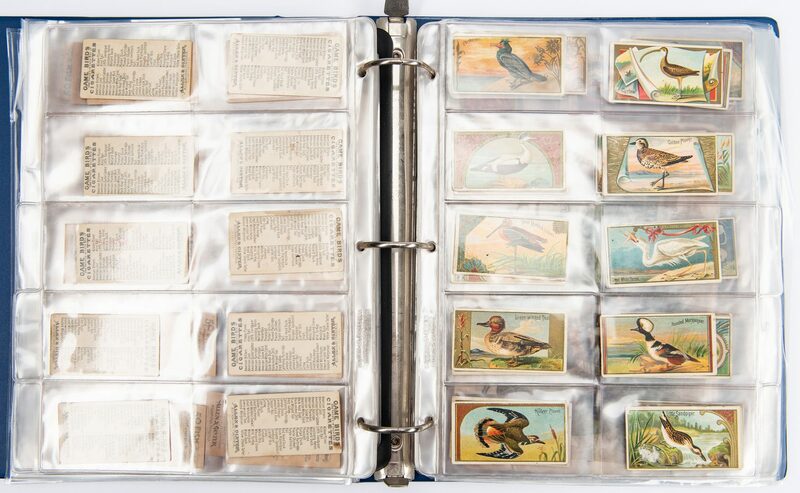 Includes "Game Birds" book, published by Allen and Ginter, Richmond, VA. Softcover with off white cord stitching, contains reproductions of each trade card with decorative vignettes and advertisements, first page and inside of back cover. 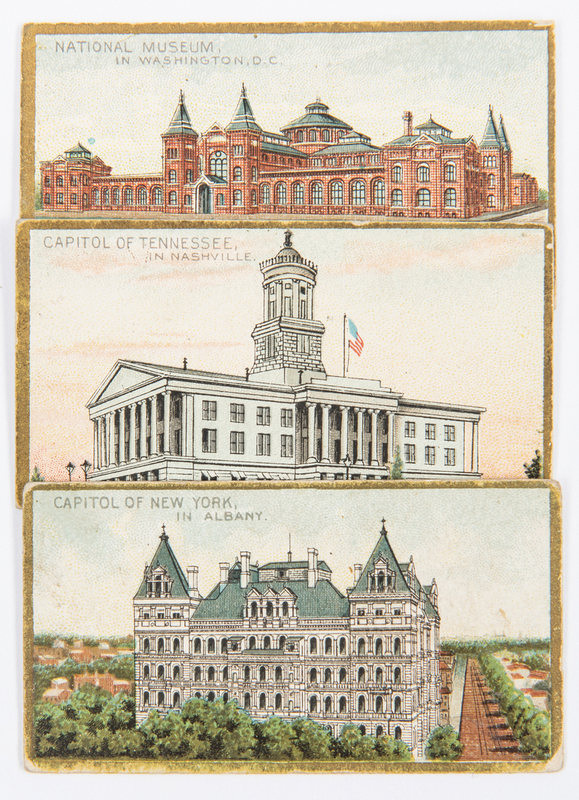 Trade cards approximately 1 5/8" H x 2 7/8" W. Book – 6 1/8" H x 8 5/8" W. 242nd-279th items: Thirty-eight (38) "General Government and State Capitol Buildings of the United States" trade cards. Lithographed by the Gast Lithograph and Engraving Company, New York, 1889. The front of each card is titled with scenic images of the building and its surroundings. The back of each card provides a list of the buildings included in the series with manufacturer's marks, below. Trade cards approximately 2 7/8" H x 1 5/8" W. 280th-316th items: Thirty-seven (37) "Parasol Drill" trade cards. Lithographed by Schumacher and Ettlinger, New York, 1888. 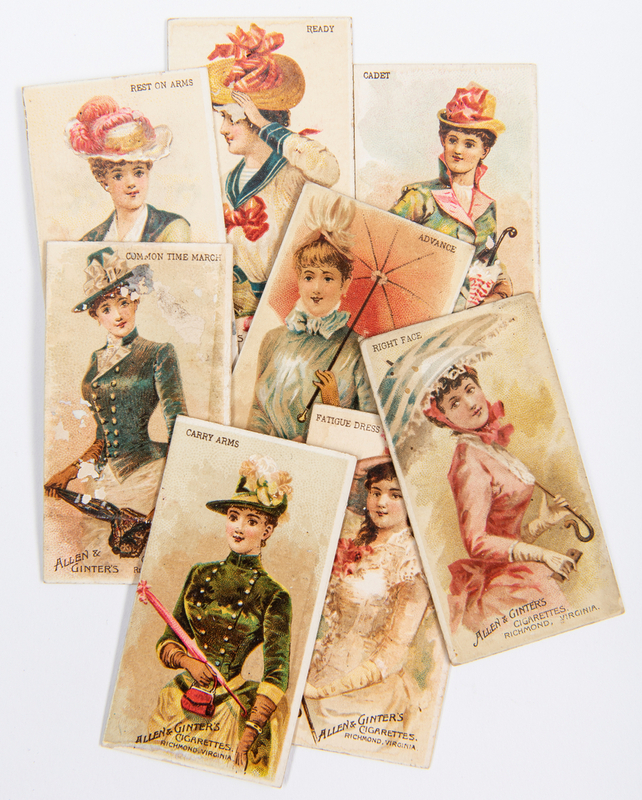 The front of each card is titled with images of ladies reenacting "drills" with their parasols. The back of each card provides a list of the "drills" included in the series with manufacturer's marks, below. 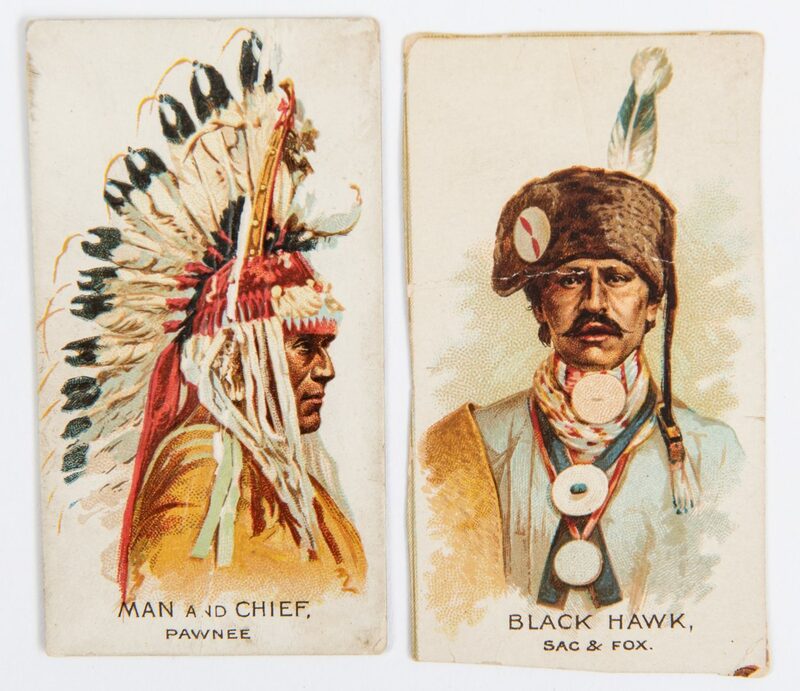 Trade cards approximately 2 7/8" H x 1 5/8" W. 317th-337th items: Twenty-one (21) "American Indian Chiefs" trade cards. Lithographed by Lindner, Eddy, and Clauss, New York, 1888. The front of each card is titled with images of Native American chiefs. The back of some cards (see condition report) provides a list of the chiefs included in the series with manufacturer's marks, below. Trade cards approximately 2 7/8" H x 1 5/8" W. 338th-562nd items: Thirty-five (35) "Racing Colors of the World", twenty-nine (29) "Naval Flags", twenty-one (21) large size "Game Birds", seventeen (17) "Wild Animals of the World", sixteen (16) "The World's Beauties" Second Series, fifteen (15) "City Flags", twelve (12) "American Editors" First Series, eleven (11) "Pet Cigarettes", ten (10) "Song Birds of the World", including nine (9) small size and one (1) large size, nine (9) "50 Quadrupeds", including six (6) large size and three (3) small size, nine (9) "Flags of All Nations", six (6) "The World's Racers", six (6) "Flags of the States and Territories", five (5) large size "Birds of America", three (3) large size "Birds of the Tropics", three (3) "The World's Champions" trade cards, three (3) "The World's Champions" Second Series, three (3) "Virginia Brights Cigarettes", two (2) large size "50 Fish from American Waters", two (2) "Pressed Cigarettes", two (2) "Fruits" trade cards, two (2) "The High Standard", one (1) "Pirates of the Spanish Main", one (1) "Types of All Nations", one (1) "Richmond Straight Cut", and one (1) "Our Little Beauties Cigarettes" trade card. Trade cards range in size from 2 7/8" H x 1 5/8" W to 5 3/4" H x 4 1/8" W. All trade cards housed in two three ring binders with plastic sleeves. CONDITION: 1st-50th item: Overall good condition with light fading and toning, errant pencil marks, creases, areas of loss, largest 1 1/2" x 5/8", to front and back of some cards. Areas of staining, largest 2 7/8" x 1 5/8", to front and back of some cards. 51st-99th items: Overall good condition with light fading and toning, errant pencil marks, creases, areas of loss, largest 2 5/8" x 1 1/4", to front and back of some cards. Areas of staining, largest 2 7/8" x 1 5/8", to front and back of some cards. Some margins appear to be slightly trimmed. 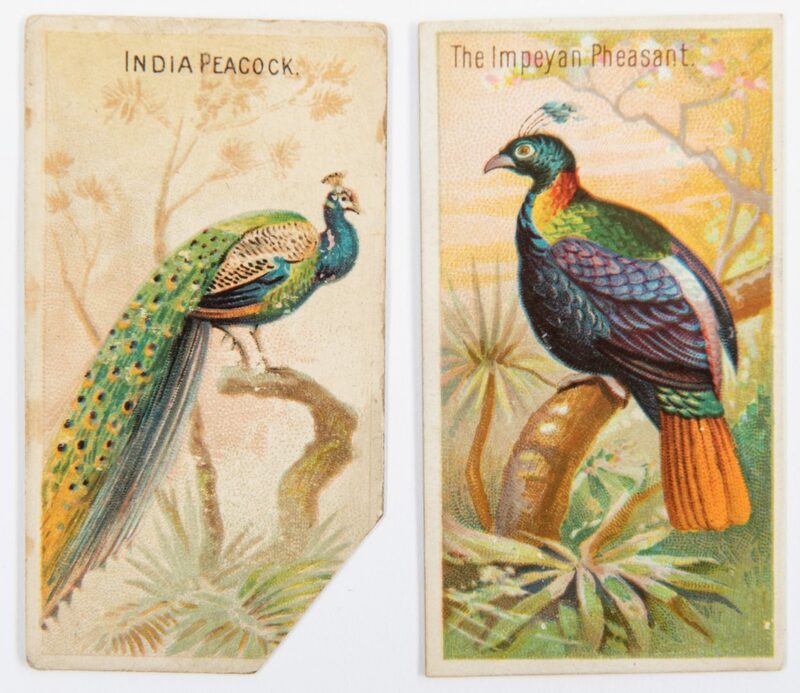 7/8" x 5/8" area of loss, lower right corner of "India Peacock" card. Two 1" x 1/2" areas of loss, above and below stitching to front cover of book. 2" tear to back cover of book. Original stitching intact, spine of book. 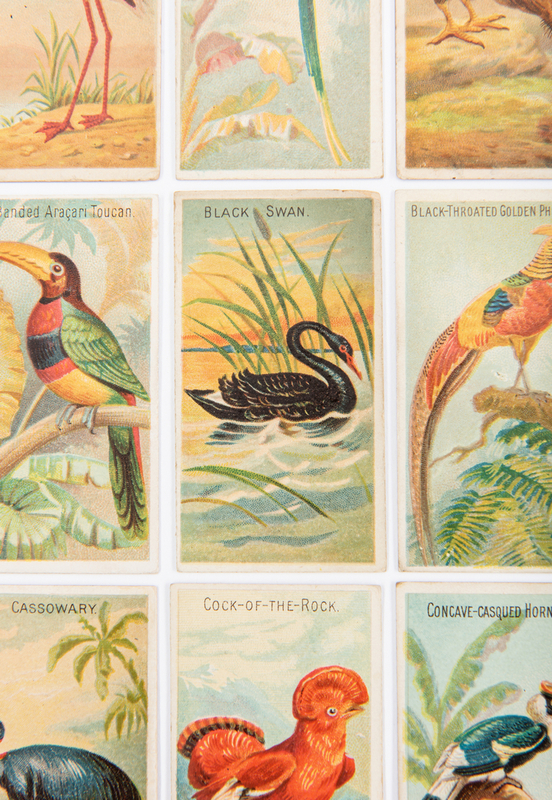 Set does not include "Sun Bittern" and "Yellow-breasted Sun Bird" cards. 100th-148th items: Overall good condition with light fading and toning, errant pencil marks, creases, areas of loss, largest 1 7/8" x 1/2", to front and back of some cards. Areas of staining, largest 2 7/8" x 1 5/8", to front and back of some cards. 1/8" x 1/8" area of loss, lower left corner of "Spaniard" card. Does not include "Soudan" card. 149th-196th items: Overall good condition with light fading and toning, errant pencil marks, creases, areas of loss, largest 3/4" x 1/4", to front and back of some cards. Areas of staining, largest 2 5/8" x 1 1/8", to front and back of some cards. Some margins appear to be trimmed. Does not include "Crab" and "Toadfish" cards. 197th-241st items: Overall good condition with light fading and toning, errant pencil marks, creases, areas of loss, largest 2 1/8" x 1 1/4", to front and back of some cards and book. Areas of staining, largest 2 7/8" x 1 5/8", to front and back of some cards and book. Some margins appear to be slightly trimmed. Areas of loss, largest 6 1/8" x 3", to front and back covers. 2 1/4" of original stitching intact, spine of book. Does not include "Canada Grouse", Great Blue Heron", "Purple Gallinule", "Roseate Spoonbill", "Snipe", and "Woodcock" cards. 242nd-279th items: Overall good condition with light fading and toning, errant pencil marks, creases, areas of loss, largest 1/2" x 1/8", to front and back of some cards and book. Areas of staining, largest 2 7/8" x 1 5/8", to front and back of some cards and book. Two cards "Georgia" and "Kansas" with majority of back missing. Some margins appear to be trimmed or missing. Does not include "War Department", "President's House", "New Hampshire", Virginia", "West Virginia", "Alabama", "Mississippi", "Illinois", "Arkansas", "Missouri", and "Nebraska" cards. 280th-316th items: Overall good condition with light fading and toning, errant pencil marks, creases, areas of loss, largest 1 5/8" x 1 5/8, to front and back of some cards and book. Areas of staining, largest 2 7/8" x 1 5/8", to front and back of some cards and book. 317th-337th items: Overall good condition with light fading and toning, errant pencil marks, creases, areas of loss, largest 2 7/8" x 1 5/8", to front and back of some cards. Some margins appear to be trimmed. A list or partial list is visible on only six cards, including "True Eagle", "Cayatanita", "Man and Chief", "Noon Day", "Bull Head", and Agate Arrow Point". The remaining 15 cards are blank with remnants of tape en verso. 338th-562nd items: Overall good condition with light fading and toning, errant pencil marks, creases, tears, areas of loss,to front and back of some cards to be expected from age.